More than 40 million people living in the United States were born in other countries, and almost an equal number have at least one foreign-born parent. Together, immigrants and their children comprise almost one in four Americans. Not only does immigration affect the environment in which everyone lives, learns, and works, but it also interacts with nearly every policy area of concern, from jobs and the economy, education, and health care, to federal, state, and local government budgets. The National Academies of Sciences, Engineering, and Medicine appointed a panel of economists, sociologists, demographers, and public policy experts to examine the evidence and to answer a very complex question – what are the economic and fiscal consequences of immigration? This is a difficult question because immigration potentially affects virtually every aspect of the economy and, moreover, outcomes may vary across time and place, reflecting the size of immigrant inflows, the characteristics of natives and incoming immigrants, and prevailing economic conditions. Additionally, some processes (such as the expense of educating the school age children of immigrants) are set in motion immediately upon immigrant arrival, while others (such as the labor market and fiscal returns on that investment when the child becomes a working adult) unfold over many years. The study panel’s findings are presented in its report, The Economic and Fiscal Consequences of Immigration (2016) . When measured over a period of 10 years or more, the impact of immigration on the wages of native workers overall is very small. To the extent that negative wage effects are found, prior immigrants—who are often the closest substitutes for new immigrants in the labor market—are most likely to experience them, followed by native-born high school dropouts, who share job qualifications similar to the large share of low-skilled workers among immigrants to the United States. Relative to findings about wages, there is even less evidence that immigration adversely affects the overall employment levels of native-born workers. Recent research finds that immigration reduces the number of hours worked by native-born teens (but not their employment rate). There is some evidence that low-skilled immigrants may reduce the employment rate of prior immigrants—again suggesting a higher degree of substitutability between new and prior immigrants than between new immigrants and native-born workers. The above findings for the U.S. by and large apply to low skilled immigrants. Until recently, high-skilled immigrants received less attention in the economics literature; but, as the number of high-skilled immigrant workers has grown, so too has interest in studying their role in the economy. Several studies have found a positive impact of skilled immigration on the wages and employment of both college- and noncollege-educated natives. Such findings are consistent with the view that skilled immigrants are often complementary to native-born workers, that spillovers of wage-enhancing knowledge and skills occur as a result of interactions among workers, and that skilled immigrants innovate sufficiently to raise overall productivity. Beyond wage and employment impacts, immigrants’ contributions to the labor force reduce the prices of some goods and services, which benefit consumers in a range of sectors, including child care, food preparation, house cleaning and repair, and construction. Moreover, new arrivals and their descendants are a source of demand in key sectors such as housing, which benefits residential real estate markets. In the longer run, immigration is integral to the nation’s economic growth. The inflow of labor supply has helped the United States avoid the problems facing other economies that have stagnated as a result of unfavorable demographics, particularly the effects of an aging workforce and reduced consumption of housing and consumer durables by older residents. In addition, the infusion of human capital by high-skilled immigrants has boosted the nation’s capacity for innovation, entrepreneurship, and technological change. The prospects for long run economic growth in the United States would be considerably dimmed without the contributions of high-skilled immigrants. Beyond wage and employment considerations, policy makers and the general public are interested in the impact that immigration has on public finances. All groups within the U.S. population contribute to government finances by paying taxes and add to expenditures by consuming public services—but the levels differ. The panel conducted several analyses estimating the fiscal contributions and costs of first-generation immigrants, the second generation (native-born individuals with at least one parent who is an immigrant), and the rest of the native-born U.S. population. Over the period 1994-2013, the net fiscal contribution (federal, state, and local combined) of first-generation immigrants was found to be, on average, consistently less favorable than that of native-born generations. Compared to the native-born, first-generation immigrants contributed less in taxes during working ages because they were, on average, less educated and earned less. However, this pattern reverses at around age 60, when the native-born (except for the children of immigrants) were consistently more expensive to government on a per capita basis because of their greater use of social security benefits. 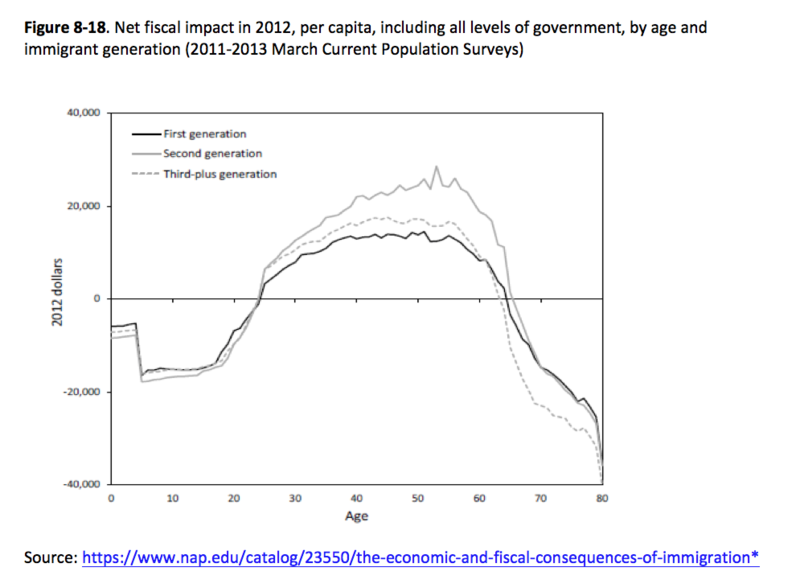 During the same time period, second-generation adults had, on average, a more favorable net fiscal impact for all government levels combined than either first-generation immigrants or the rest of the native-born population. Reflecting their slightly higher educational achievement, as well as their higher wages and salaries, the second generation contributed more in taxes on a per capita basis during working ages than did their parents or other native-born Americans. 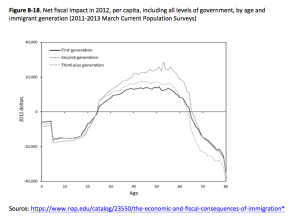 The relative fiscal contributions made by different generations, shown graphically by age in Figure 8-18 of the report (and below), highlights the stellar performance of the children of the foreign born. At any point in time, the net fiscal contributions (or costs) of immigrants and of the native born are significantly influenced by their age structures which, in turn, influence the percentage of each group in schooling, in the workforce, and in retirement. Importantly, results are also driven to a large extent by the assumptions underlying each analysis, especially about the allocation of government expenditures on public goods such as national defense. For example, for scenarios in which military spending is assumed not to increase with additional immigrants, and in which a cost of zero is assigned to them for this benefit, the net fiscal impact of individuals in the first-generation group becomes more positive than that of individuals in the native-born groups. In addition to conducting historical analyses, the panel also modeled the impact that adding an immigrant to the U.S. population would have on future public budgets. Projected over a time horizon of 75 years, this analysis found that the fiscal impacts of immigrants are generally positive at the federal level and generally negative at the state and local level. State and local governments bear the main burden of providing education benefits to children, including those in immigrant households, but their methods of taxation recoup relatively little of the later contributions from the resulting educated adult taxpayers. 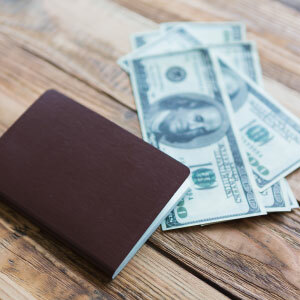 Federal benefits, in contrast, are largely provided to the elderly, so the relative youthfulness of arriving immigrants, who are often working and paying taxes, means that they tend to be beneficial to federal finances. The panel’s analysis of state- and local-level data indicates that the net impact of immigration on fiscal balance sheets varies tremendously across jurisdictions. Consistent with findings in the national-level analyses, first-generation adults (and their dependents) tend to be more costly to state and local governments on a per capita basis than adults (and their dependents) in the second generation or in other native-born generations. In general, second-generation adults contribute the most of any generation to the bottom line of state balance sheets. The analysis also reveals that an immigrant and a native-born person with similar characteristics will likely have about the same fiscal impact.